A couple of weeks ago there was a fairly spirited exchange between the former MP Louise Mensch and the feminist writer Laurie Penny over the phrase “check your privilege”, which started out as a feminist term on Livejournal, and has turned into something of a Twitter trope. It’s mostly (though not exclusively) used in online feminist debate. Louise Mensch isn’t a fan of it. And that is what the modern feminist movement has become. Full of intersectionality, debates about middle-class privilege, hand-wringing over a good education (this is again “privilege” and not well-deserved success), and otherwise intelligent women backing out of debates and sitting around frenziedly checking their privilege. It does nothing. It accomplishes nothing. It changes nothing. Laurie Penny defended the term. Telling someone to “check their privilege” isn’t the same as censoring or silencing, but to people who aren’t often introduced to the concept that they might be wrong, it can sometimes feel that way. When someone asks you to check your privilege, it doesn’t mean you should stop talking – it means you should start listening, and sometimes that involves giving the other person in the room a chance to speak. That’s what often upsets people most about the whole idea. It’s about who gets to speak, and who has to listen, and social media is changing those rules. I’ve been pondering this for a while, and I’m going to give a list of what I think are some of the problems with privilege-checking. Some have suggested that the only people who have an issue with being asked to check their privilege are those who are privileged themselves. Given that I’m white, male, straight, cisgender, middle-class and able-bodied, quite possibly I may be guilty as charged here. But here’s something I’ve noticed about the often-virulent arguments between feminists on social media (anyone who says, “If feminism ruled the world, there’d be no war” doesn’t have a Twitter account). These are debates where I’m at best an ally and at worst merely an outside observer, but when I’ve criticised some of the discourse, I seem to get an easier ride than when those on the inside say the same thing. Why are those involved expending so much energy to hurl vitriol at other feminists like Louise Mensch, Caitlin Moran and Helen Lewis? Why aren’t they flaming me? 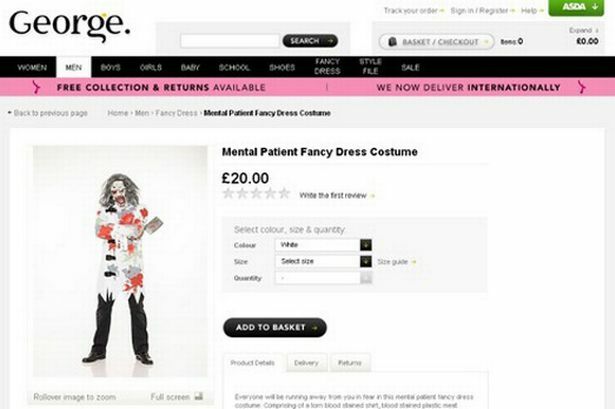 I suspect that might be one to file under, “Be careful what you wish for”. 1. Not all privileges and oppressions are immediately apparent. When someone says “check your privilege”, it suggests that they know what privileges the other person has. Trouble is, there are plenty of hidden oppressions and privileges. A history of mental health problems and/or childhood abuse, for example. I recently spoke to a woman with an anxiety disorder who got Twitterstormed by various feminists who (wrongly) interpreted a comment by her as transphobic. Getting bombarded with abusive messages telling her to check her privilege for several hours prompted a mental health relapse. Even apparently straightforward privileges/oppressions might not be especially visible, especially if all you know about someone is from their social media profile. I spoke to a woman who’d been accused of showing her “white privilege”. When she pointed out that she’s actually mixed-race, she got the retort that since she could pass for white, she still has white privilege. 2. It’s patronising and dismissive. 3. 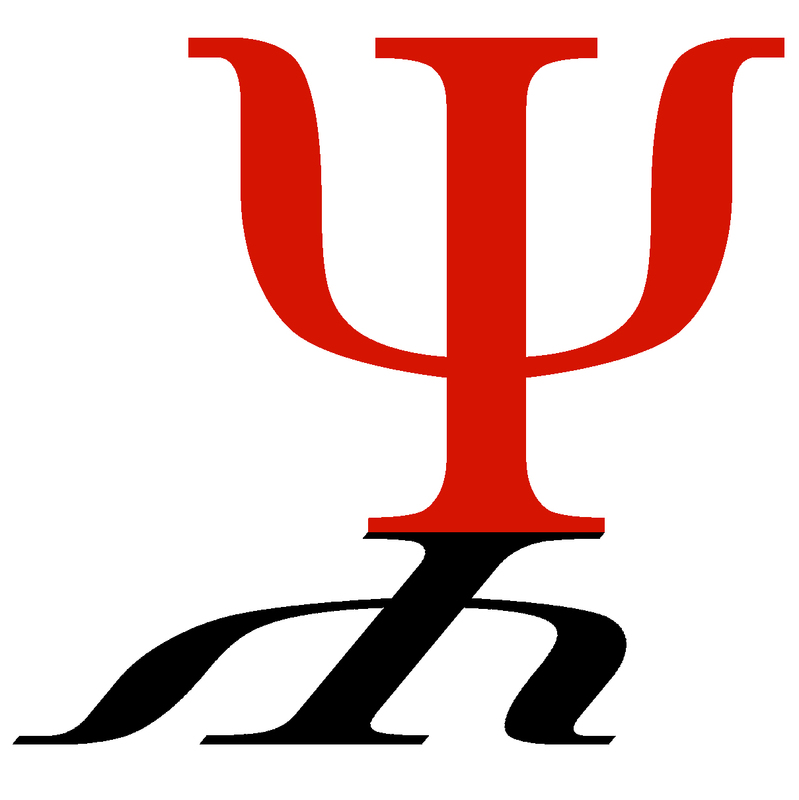 Privileges and oppressions don’t necessarily affect prejudices in straightforward, linear ways. This point leads me onto the question whether we should really be talking about prejudice rather than privilege. There seems to be an assumption in “check your privilege” that more privileged = more prejudiced and more oppressed = less prejudices. Okay, there’s plenty of examples where that’s true, but by no means always. George Orwell was educated at Eton, and went on to become one of the sharpest observers of injustice and the abuse of power in English literary history. Or there’s Joe Strummer, the son of a diplomat. Sadly it can also be the case that some people subject to various oppressions can internalise the oppressor’s logic, and even applying it to their fellow oppressed. 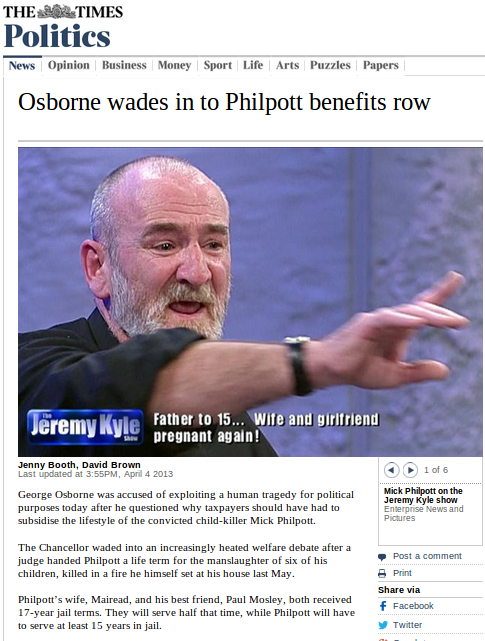 There isn’t a shortage of people on benefits who will tell you that there’s too many benefit scroungers in this country – though they’d frequently be mortified if someone suggested that they might be seen in the same way by others. Likewise, a while back I had a conversation with a Nigerian-born woman, and was surprised to discover that her views on immigration were well to the right of mine. She simply didn’t view herself as that sort of immigrant. 4. Privilege isn’t the only thing that affects prejudice. Don’t get me wrong, I’m not saying privilege doesn’t affect prejudice. 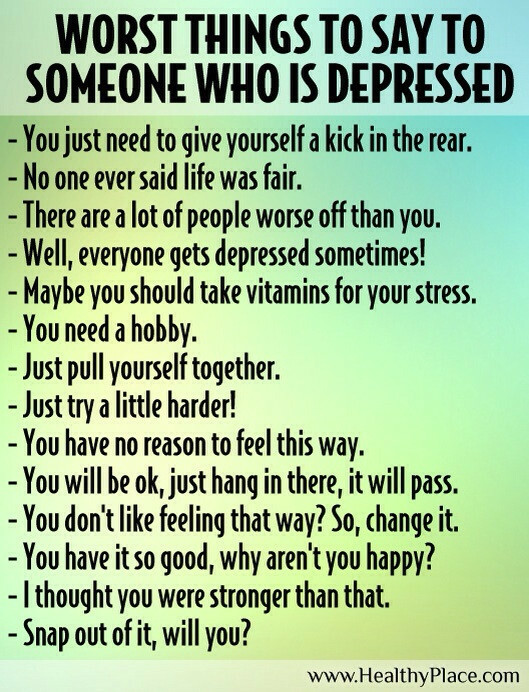 It can affect it a lot. But it’s not the only thing – what about your life experiences, the people you’ve met, your cultural background, the books (and blogs and Twitter feeds) that you’ve read? this is why I think it’s better to have a wider discussion about prejudice (of which privilege can be a part) rather than talking simply about privilege. 5. It talks at people rather than with people. And even if it is used as an invitation to listen, is the other person also listening? I actually agree with Penny that social media is changing the way people communicate, but for slightly different reasons. Social media changes the old world of books and newspapers from one in which ideas are presented to the public, into one in which those ideas are co-created by people talking and listening with each other rather than at each other. Ultimately, I don’t think people’s views are changed by simply tweeting “check your privilege” at each other, and in that sense it fails in its purpose. It doesn’t get the recipient to think differently. If anything, it’s the obsolete old media thinking of talking at people rather than with them. I think views are changed through civil constructive discourse where people tell each other about their own lives rather than presuming to tell someone else about theirs. I’m idly flicking through a copy of The Burning of Bridget Cleary by Angela Bourke. It tells the tale of what’s sometimes referred to as “the last witch-burning in Ireland”. In 1895 Bridget Cleary, a 25 year old woman from County Tipperary, Ireland, was burned alive by her husband. It was a bizarre and grotesque tragedy in which her assailant used an unusual defence. He claimed that his wife had been abducted by the fairies, and he had only killed her changeling rather than Cleary herself. The case provoked huge media interest, and that interest turned into politicised comment. To give a flavour of how this was reported in some quarters, here’s a quote from the Clonmel Nationalist around the time of the trial. We found yesterday that the dreadful occurrence has been utilized editorially by the Tory-Unionist Dublin Evening Mail for purposes of political capital and as a suitable occasion to pour forth slander, odium and abuse on Irish people generally; to stir up racial and religious passion and prejudice, and if possible to damage the cause of Home Rule. As you might gather, right-wing newspaper barons used this unusual and shocking event to slander an entire people, dismiss them all as unreasoning savages, and to advance a political agenda against them. Thank goodness we live in 2013, not 1895. This is a much more responsible media era. In the last couple of weeks the Royal College of General Practitioners published their Social Media Highway Code. As a professional with a longstanding interest in how social media can be used constructively in mental health, I’ve often been disappointed that most guidance being issued tends to focus only on the negatives and risks of this new form of communication. The Highway Code is a welcome antidote to that: it acknowledges the risks and and the need to behave online in a professional way. However, it also recognises that social media has rewards and opportunities. I highly recommend it not only to doctors but to all health professionals. Which makes it unfortunate that today I got caught up in the absolutely atrocious online behaviour of a doctor. A TV doctor, no less. I don’t actually watch the TV show Supersize vs Superskinny, hosted by Dr Christian Jessen. I work with children and adolescents with eating disorders, and watching a show about it feels a little like taking my work home with me. I know that some people with eating disorders have complained of experiencing triggers from the show. Ilona Burton is a journalist who writes for the Independent about eating disorders. She writes passionaately and well about the subject, not least because she’s in recovery from an eating disorder herself. In 2012 she was nominated for the Mark Hanson Award for Digital Media in the Mind Media Awards. She also holds strong views about the content of Supersize vs Superskinny, which she regards as socially irresponsible. 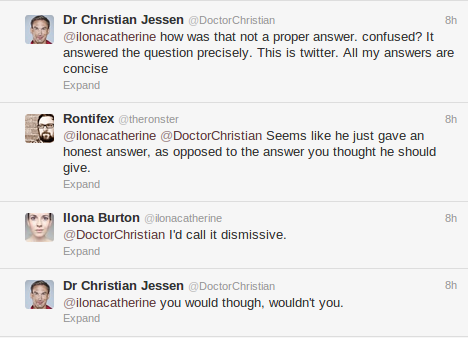 Early today, an increasingly heated debate was building between Dr Jessen and Ilona. 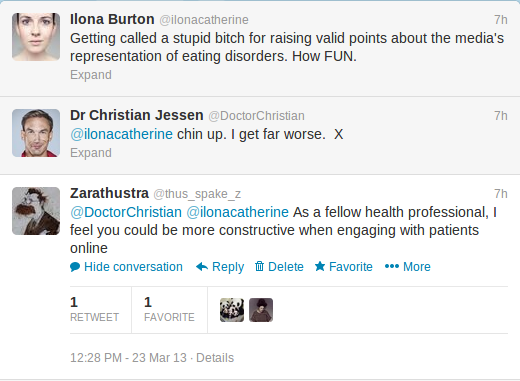 Dr Jessen then started retweeting Ilona to his 222,000 followers. 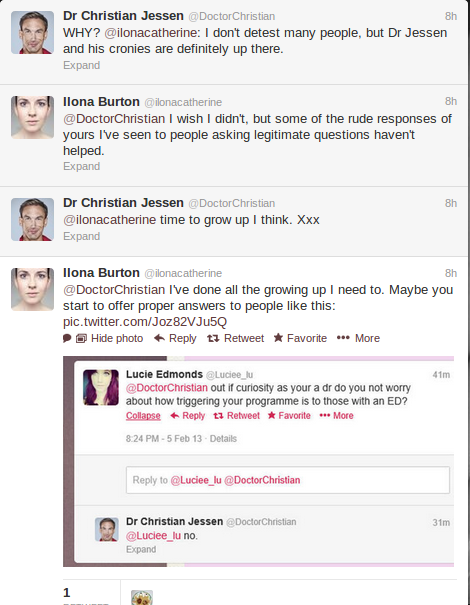 The result was that Ilona started receiving tweets from Dr Jessen’s fans, some of them abusive. Ilona was clearly distressed by this, which really didn’t seem to concern Dr Jessen. For that reason I threw my own tuppence into the ring. I also tweeted him a link to the RCGP Social Media Highway Code, and suggested he pay attention to Section 7, “Treat Others with Consideration, Politeness and Respect.” He didn’t reply directly, but responded by retweeting me. The result was that I too started getting a large volume of tweets, which quickly turned into a Twitterstorm. As with the content being aimed at Ilona, some of the tweets I received were also hostile or downright abusive. It went on and on, lasting for several hours. This wasn’t helped by Dr Jessen retweeting more of my responses. Okay, maybe that last tweet by me was a little tetchy, but getting several hours of online abuse does that to me. I’m a fairly opinionated tweeter, so I’m no stranger to getting hostile messages. I’ve had some nasty stuff thrown my way by supporters of UKIP, and also by people who object to the work of child protections services. I can honestly say that today was the worst and most intense level of trolling I’ve ever been subjected to. I don’t feel I need any sympathy for that. I’m big enough and ugly enough to handle it. However, I’m saddened that it happened at the instigation of a fellow healthcare professional. I’m even more saddened that the brunt of it was also caught by someone who has lived experience of one of the very conditions that Dr Jessen talks about in his show. 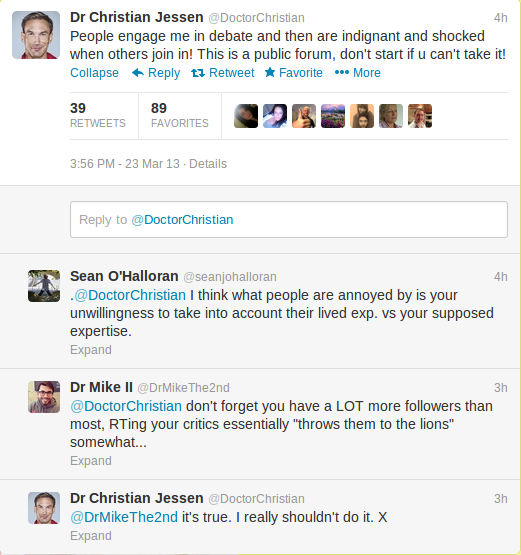 Dr Jessen seems rather unrepentant about all this. What does the Social Media Highway Code say? You have a right to express your views openly–but not to do so in a way that causes offence to others or infringes on their own rights…. HEALTH WARNING: making derogatory,threatening or defamatory comments about others could have a harmful effect on your career. ‘I was just blowing off steam’ may be an honest explanation, but is not likely to be accepted as a valid justification by professional bodies or employers. I hope Dr Jessen takes up my suggestion of reading the Highway Code. Meanwhile, Ilona has posted her own thoughts on the matter in a vlog.